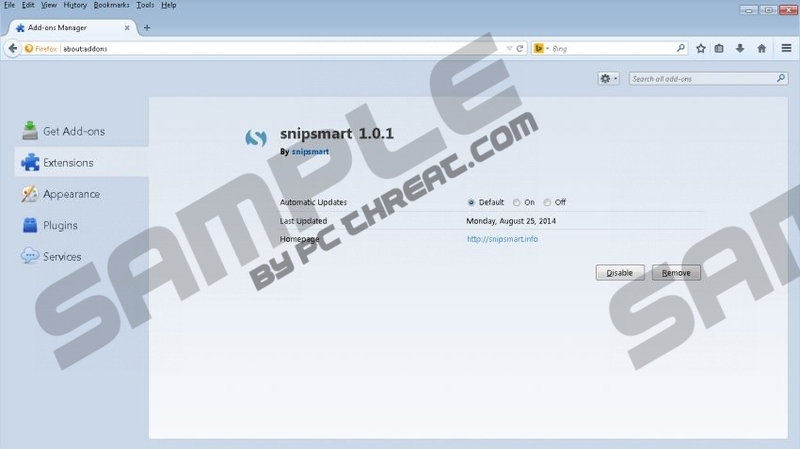 SnipSmart is yet another adware application crafted by the SuperWeb LLC group that is quite infamous for producing internet-based infections such as Surftatic, Fortunitas, Windows web, Klip Pal, PlumoWeb and many others. Almost every product developed by this group should be removed instantly if found present on your PC. Just like so many adware applications SnipSmart is also marketed in dubious ways. Publishers of this application promise you to enhance the online shopping experience by displaying useful comparison deals that should help you save money and time. It is quite ironic that the application that promises to help you will only disturb you while shopping online or simply surfing the web. In reality, all of those adverts provided by SnipSmart are useless and could even be detrimental. Removal of SnipSmart is the only smart thing that you should do regarding this adware program. You can do that by executing the removal guide that we provide below this article. SnipSmart relies on browser extensions in order to display adverts while you are browsing the web. Once SnipSmart enters your system it will install extensions to Mozilla Firefox and Internet Explorer. After that your browser will be flooded with adverts and annoying pop-ups whether you like it or not. Mostly these advertisements will be displayed at random times. All of this will turn web browsing into a task of annoyance and frustration. Thus, it is quite obvious that marketing slogans are misleading to put it mildly, and the only way to stop these annoying activities is to remove SnipSmart without hesitation. Unfortunately, that is not all that this invasive adware application is capable of. What is even worse is that SnipSmart might display adverts that could contain redirect links to potentially corrupted websites. It was noticed that you could be redirected to a website implemented with an arbitrary code execution exploit. That means that your system would be infected within seconds if you would land on such a website. It is quite obvious why removal of SnipSmart is a must. Any user that is security conscious should avoid any dubious applications at all cost. Delete SnipSmart and implement a reliable antimalware tool that would provide overall security of your system at all times. In order to remove SnipSmart you will need to execute the instructions that we provide below with caution because even one mistake could mean that some traces of the infection are still present on your system. In some cases, leftovers could be used in order to restore the malicious application silently. Moreover, they could also be used by other internet-based infections as a gateway. That is precisely why we advise you to install a professional malware removal and detection tool. After doing so scan your system and remove any leftovers. How to remove SnipSmart from your operating system. Now select SnipSmart and then click Uninstall. Now double-click SnipSmart in order to remove it. Click the Start button and the select Control Panel. Then select and remove SnipSmart. Quick & tested solution for SnipSmart removal.